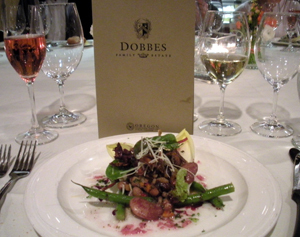 April’s Wine Makers’ Dinner at Rafati’s Encore310 featured the Dobbes Family Estate wines. Their winery is located “downhill at the only stoplight in Dundee.” Joe Dobbes uses only Oregon grapes for his wines. He is also one of the hosts of NW Vine Time on KXL radio, Saturdays from 4-5 pm. Many factors tried to keep me from attending the wine dinner. My dining companion Krista had to drop out due to family care issues, and my husband also had to go to see his ailing mother. But I booked a room at the University Place Hotel so I wouldn’t have to drive home and boldly decided to brave it alone. 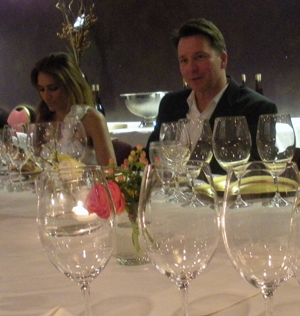 Nobody is alone at one of the Wine Makers’ Dinners at Encore 310. The owner Reza Rafati greets everyone and I have yet to find anyone who wasn’t eager to meet newcomers and engage them in conversation. I chatted with Joe Dobbes and had to admit that my husband and I had managed to miss their winery. Mr. Rafati invited me to sit next to him, since I was a lone woman, and I was very pleased to do so. The gathering was smaller than last month, with 20 present, in part due to the Blazer playoff game. But that made it even more intimate and merry. We enjoyed a Spanish pinot noir champagne while meeting and chatting. 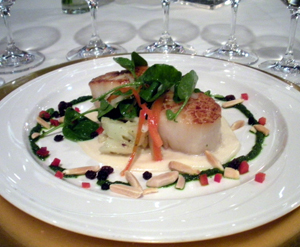 The first course was seared scallops in a cauliflower puree with almonds and currants, served with 2007 Dobbes Family Estate Pinot Gris. The flavors of the dish were subtle but perfectly brought out the notes in the pinot gris. It was an excellent pairing. Joe Dobbes spoke eloquently about his winery and his history in making wines. He is an Oregon native who spent years studying winemaking in Germany and France. After making wine for several Oregon labels, he set up his own shop as Wine by Joe in 2002. The second course was an endive and heirloom bean salad with peas and oyster mushrooms, served with 2006 Viognier. The dish was delicious and I truly enjoyed the viognier, which is one of Joe’s favorite wines to create. The grapes are from an organically farmed vineyard in the Rogue Valley. 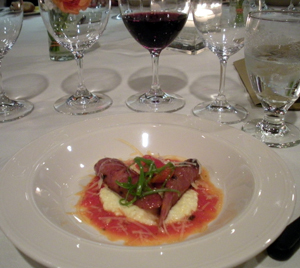 The third course was a chicken apricot ginger sausage with peppers and polenta. It was served with a 2007 Skippers’ Pinot Noir. Ah, this is a pinot I need to buy. It is a Rogue Valley pinot noir, named after Joe’s daughter. It isn’t released yet, but is very drinkable now. 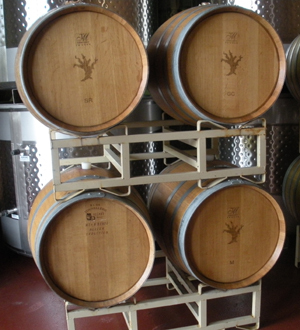 It escapes some of the problems seen with 2007 Willamette Valley pinots. The sausage was also delicious. 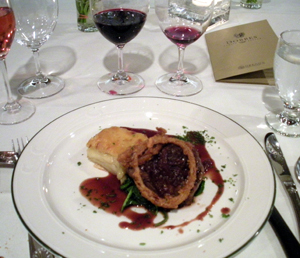 The fourth course was a wonderful beef tenderloin topped with wine braised onions and a potato gratin, accompanied by a 2005 Fort Miller Syrah. The steak was excellent, and the wine was as well. Together they were magic. I wished my husband could attend these dinners, but he has some food allergies. Reza Rafati said to call him and he could ensure my husband got a portion that didn’t have onions or pepper. I hope I can entice Rich to attend, as this food and wine are a great experience. “Because this is Rafati’s, we have a cheese course,” our host said. The delicious cheeses were accompanied by a 2005 Grand Assemblage Syrah and a 2005 Griffin Pinot Noir. I liked both, but preferred the pinot. By now, I was definitely grateful that my destination was a hotel room upstairs. The conversation kept flowing, with never a dull moment. Although I was a newcomer, everyone was treated as an old friend. 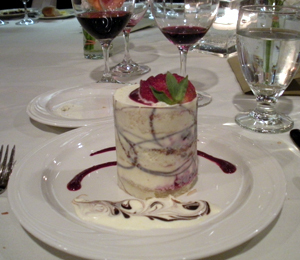 The dessert was a berry’misu tower, and it was a perfect ending. 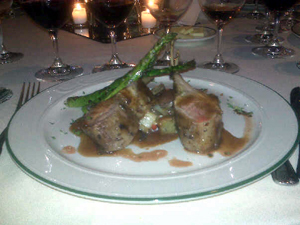 It was served with a 2006 Late Harvest Viognier that was rivaled a German beerenauslese. I hope to make it to most of these monthly wine maker dinners. The food, the wine, and the company make it one of the best local getaways you can buy. Our wine tasting weekend took to two local wineries that feature good wine at a good price. Our first stop was the Chocolate and Pinot Noir event at Willamette Valley Vineyard. The place was packed. It was hard to get a spot at the bar to get a splash of the wine to be tasted. My walking team mate Krista joined us for her first explorations in to pinot noir. Rich and I agreed that the WVV pinots are tasting better. But our focus from them is still on the semi-sparkling Frizzante and the Oregon Blossom wines. The next stop was a winery new to us, Redhawk Winery and Vineyard just north of Salem in the Eola-Amity Hills AVA. We were the only ones in the tasting room and had a very enjoyable time tasting our way through their offerings. Their emphasis is “small quantities of high quality, yet affordable, wines.” First stop was their popular Grateful Red pinot noir. I liked it, especially at $14 a bottle. We were also impressed with the Cabernet Sauvignon (Columbia Valley) and the Reds Cuvee (Columbia Valley). Krista bought their version of port. 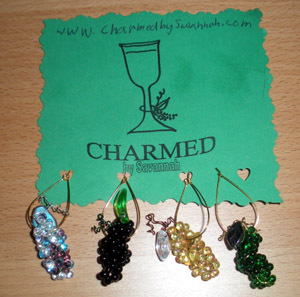 For all of the offerings, the prices were reasonable. It was a pleasure to find another great local winery where we could find good wine at a good price. Trisaetum Vineyard held its grand opening this weekend. It is an organic and biodynamic vineyard specializing in riesling and pinot noir. It is located in the Ribbon Ridge AVA, just east of Carlton, Oregon and north of Dundee. We learned of this event through a co-worker who is an in-law of the Frey family who own the winery. In fact, she met us at the entry as she was restocking the paper towels in the restroooms. Business was good and they needed her help. The winery was lovely, with the gates and drives laid out nicely. Inside, abstract impressionist art graces the walls, most of it the work of owner James Frey. The wines are produced in small batches, with two of them produced just for their wine club and the opening event. First stop was the riesling table. We love a nice riesling and this one was one of the better ones. Next, we had the first of three pinot noirs, each one crafted differently. Rich and I preferred the first one with the fruity notes we love from this region – black cherry especially. But the next two pinots were also excellent. Even though they were 2007 vintages, each was drinkable in its current young state. 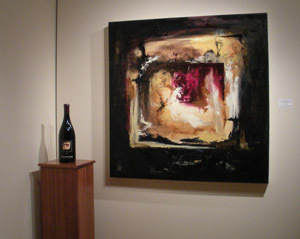 Back upstairs, we had a late harvest pinot blanc and enjoyed the art work. Trisaetum is definitely a winery to watch for the future.